Bonjour from Paris! These Salted Caramel Truffles feel especially appropriate to share with you today because if the trip is still following the itinerary I meticulously crafted in Google docs, I spent this morning at my favorite chocolate shop and this afternoon at my favorite caramel store (you can read about both of them here). I wish I could bring all of you with me, but since we wouldn’t all fit inside a single truffle shop anyway, I have the next best thing: an easy recipe for Salted Caramel Truffles that anyone can make, no culinary expertise required. This post is brought to you by Morton Salt. The truffles are dark-chocolate dipped, then topped with a crunch of coarse sea salt, one of the pro tips shared at the Morton Next Door Chef event I attended last fall. Read on for the tasty details about the recipe and the event too. Getting a homemade salted caramel sauce to a consistency that’s thick enough to enrobe in melted chocolate to create a caramel-filled truffle, yet soft enough to still melt and ooze when you bite into it, is a tricky endeavor that I’d prefer to leave to a French pastry chef. 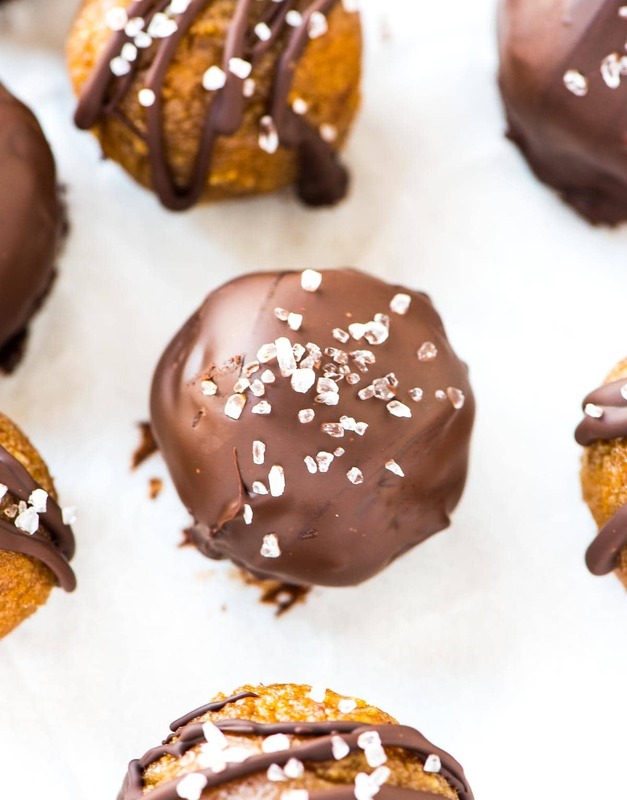 Hence, for this Salted Caramel Truffle recipe, we are skipping the actual caramel entirely. Stay with me here. 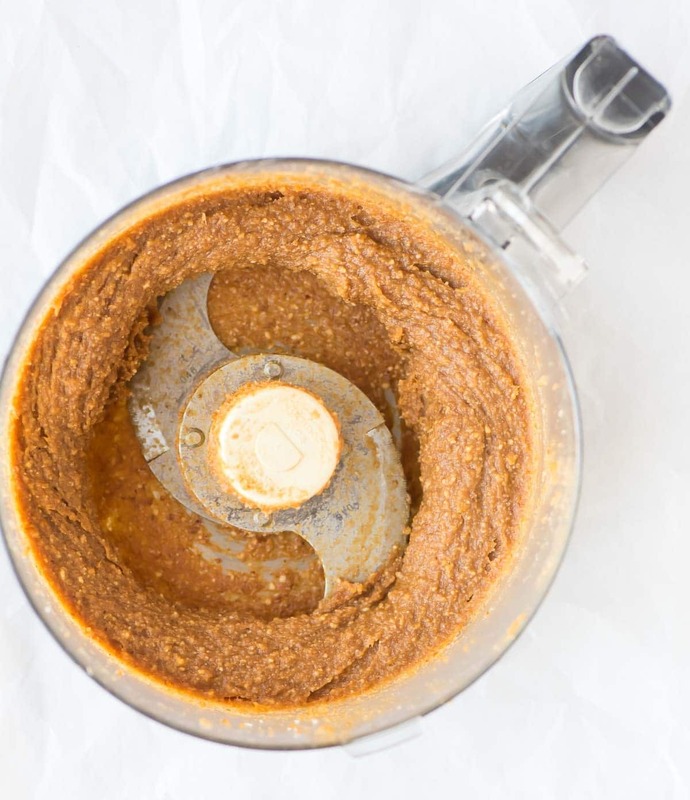 Instead of meticulously heating butter, sugar, and heavy cream in a saucepan until the temperature, color, and bubbles were just so, I piled dates and cashews in a food processor and blended them until they were smooth, creamy, and positively luscious. That’s it! Dates have a natural caramel-like sweetness, and cashews are buttery. Combine the two with vanilla, coconut sugar, and salt, and the resemblance to salted caramel is complete. The final ingredient that makes these caramel truffles truly shine is a sprinkle of coarse sea salt. 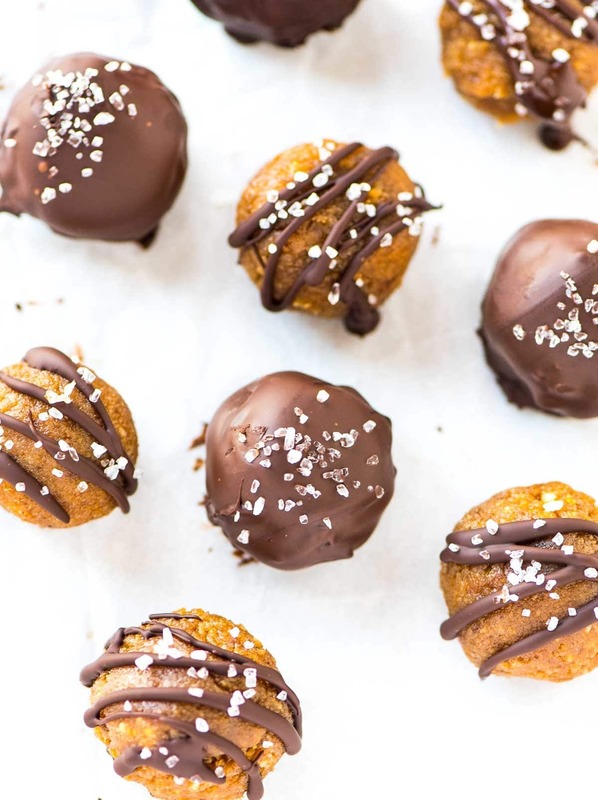 It balances the sweetness from the chocolate and dates, gives the caramel truffles a tiny crunch, and is without a doubt the reason you won’t be able to stop eating them. If you’ve made any of the recipes from my site, you might notice that I always call for kosher salt or sea salt instead of regular table salt. A friend who is a great cook once had me taste them side by side, and I was shocked by the difference. Kosher salt is easy to control and perfectly seasons food, while sea salt adds the perfect “pop” and contrasting texture to dishes like these Salted Caramels. Table salt doesn’t offer either of these qualities. The kosher salt is my go-to for all basic cooking and baking, and I use sea salt when I want to truly see and taste the salt. I’m not sure how Morton Salt discovered my love for kosher and sea salt, salted caramels, and travel, but the word must have spread. Last fall, the brand invited me to attend a commercial taping for its Next Door Chef series in Nashville, Tennessee. I was only able to tell you a tiny bit about it then, but now that the video is finished, I can give you the rest of the juicy details! When I received the initial invite to fly to Nashville for 24 hours to eat a beautiful gourmet dinner prepared by a local chef, all while being recorded for video, I honestly thought it must have been a mistake. Two weeks later, I was eating one of the most wonderful meals of my life in a gorgeous setting while trying to casually ignore the cameras that kept buzzing in and out of sight. Act natural, I told myself. And don’t chew with your mouth open. 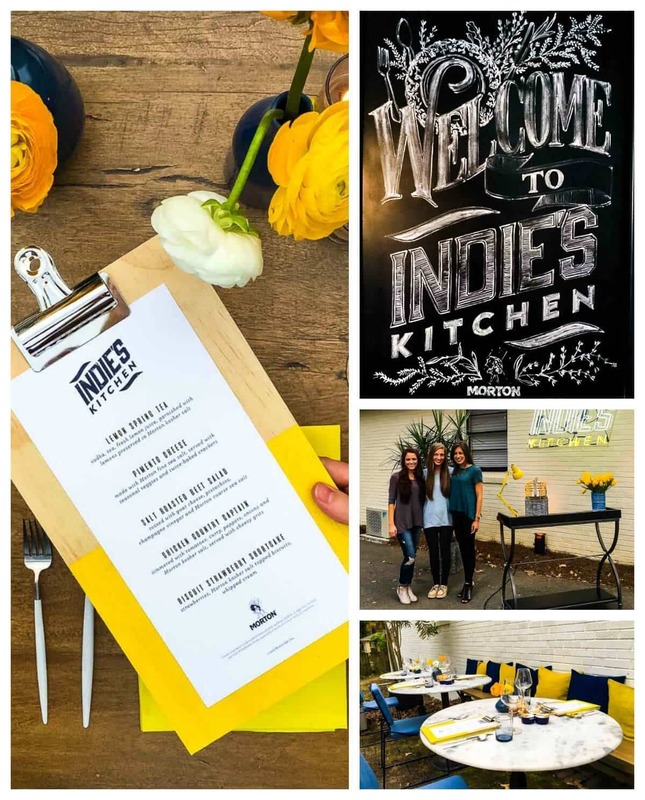 The concept of Next Door Chef is that a local celebrity chef comes into a community member’s home, teaches him or her how elevate his or her cooking through the proper use of kosher and sea salt, then transforms his or her home into a restaurant for a night. When I found out that the Nashville chef would be Karl Worley, I actually yelped with excitement. I had met Chef Karl on a prior trip to Nashville and was immediately impressed by his cooking, personal warmth, and humility. He serves the best biscuits you will ever eat in your life at his restaurant Biscuit Love (I still think about them), and that night in Nashville, he crafted a beautiful, spring-focused menu for an entire crowd of hungry diners. The meal featured seven epic courses, and each used kosher salt and/or sea salt to make the flavors shine. I truly loved every bite, from the chicken country captain to the pimento cheese to the salted beet salad, but if I could only eat one course again, it would be the biscuit strawberry shortcake. The dish combined Chef Karl’s life-altering biscuits, homemade whipped cream, and strawberries that had been soaked in a sugar-salt brine. I’d never added a pinch of salt to strawberries before, but after experiencing how it intensified their flavor, I will never top my shortcake any other way. Nor will I top my Salted Caramel Truffles any other way! Give this recipe a sprinkle and see if you agree. You can check out the Nashville episode of Chef Next Door here and snag the recipes from our meal too. 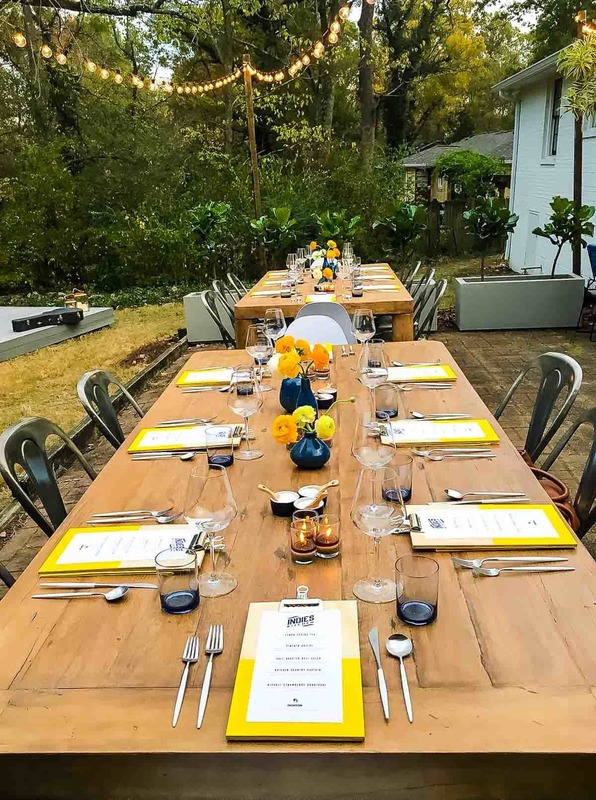 Chef Next Door New Orleans is coming this summer, and if the menu is half as delicious as our spring-inspired Nashville feast, I know the attendees are in for a true treat. 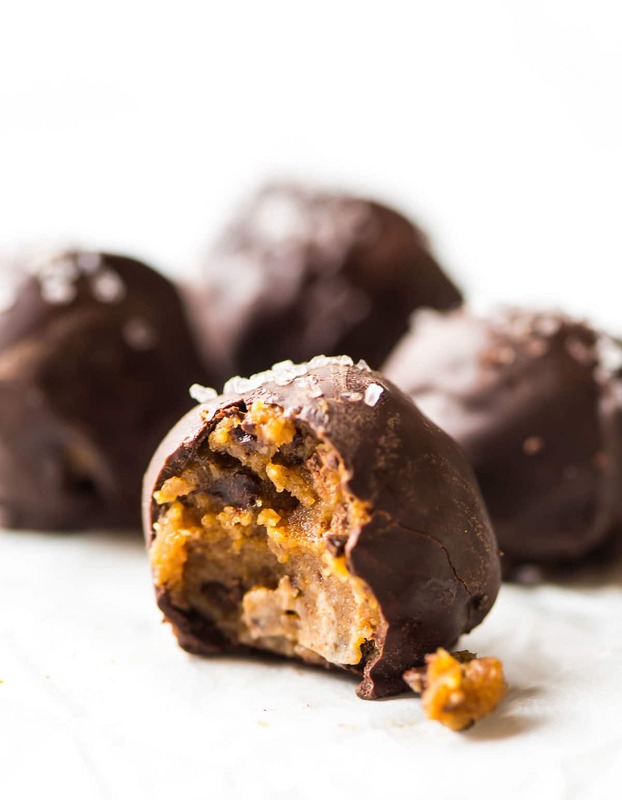 Easy, no-bake recipe for vegan salted caramel truffles, made with a date cashew caramel filling and dipped in dark chocolate. Place the dates and cashews in a small bowl and cover with boiling water. Let sit 10 minutes, then drain and lightly pat dry. Place in a food processor fitted with a steel blade. Pulse in long bursts until the mixture forms a sticky paste and only small bits remain, stopping to scrape down the bowl a few times as needed. Add the coconut sugar, vanilla extract, and kosher salt. Pulse a few times to incorporate, then continue blending until you have a fairly smooth "dough." If the dough is too sticky to handle, place the food processor (with the dough inside) in the refrigerator or freezer for 10 to 15 minutes to firm up. Line a baking sheet with parchment paper. With a small scoop or spoon, scoop a portion of the dough, then roll it into a ball with your hands. Place the ball on the baking sheet. Repeating with remaining dough. (You will have 12 to 15 truffles total, depending upon how large you roll them.) Place in the freezer to firm up for 10 to 15 minutes. Meanwhile, to make the chocolate topping, place the chopped chocolate in a heatproof bowl, then set that bowl over a pan of simmering (not boiling) water. Make sure that the bottom of the bowl and the water do not touch. Melt the chocolate, stirring often. When the chocolate is almost completely melted but you can still see a few pieces, remove the bowl from the pan. Add the coconut oil and stir until smooth and glossy, letting the residual heat of the chocolate melt the mixture the rest of the way. Remove the truffles from the freezer. To completely dunk the truffles in chocolate: working one at a time, dip a truffle into the melted chocolate. Use two forks to roll it around so it’s coated, then use the forks to remove the truffle from the chocolate and lightly tap away any excess chocolate. Place the truffle on the parchment paper, then top immediately with sea salt. Be sure to sprinkle it right away—the chocolate sets fast! Repeat with remaining truffles. Let sit at room temperature for a minute or two to set. Enjoy! 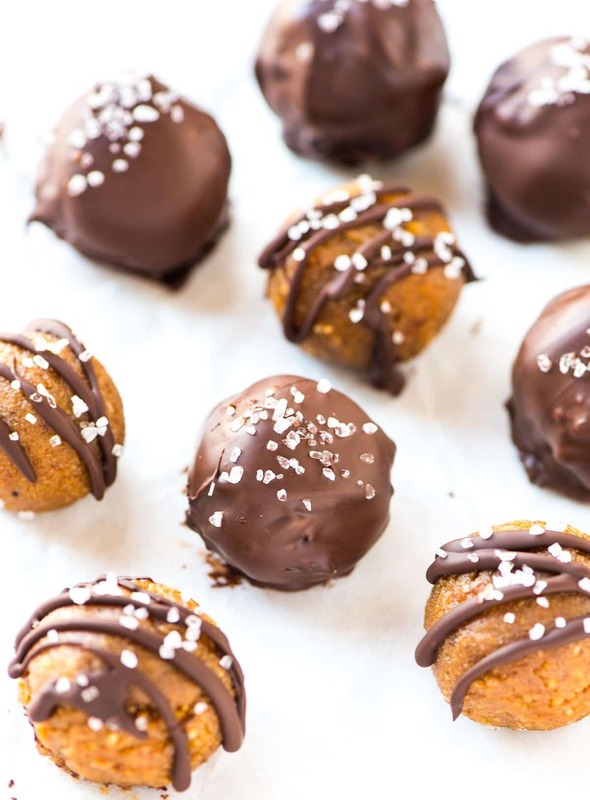 For a lower-calorie version, drizzle the chocolate on top instead of completely coating the truffles. I am sharing this post in partnership with Morton Salt. As always, all opinions are my own. Thanks for supporting the brands and companies that make it possible for me to continue creating quality content for you! Aren’t dates just the best natural sweetener? Ugh they make the best caramels! You can fool anyone with these truffles into thinking that they are full of sugar and butter! They really are, Bethany! Thank you! I love the combination of dates, cashews, and coconut sugar – that sounds like the perfect caramel!! :) Also, the Next Door Chef experience sounds amazing… I wish they’d come to Connecticut! omg….. I feel like that’s all I can say. These look amazing! These look fab! I’ve been following your adventures on IG stories. I hope you’re having a great time. Not sure I had the right type of dates but turned out OK for my taste. My mixture made 20. Go easy on the salt.? Thanks so much for taking the time to report back, Marjorie! You can certainly adjust the salt to your taste if you do make the truffles again! Made these and can report they are super easy and so delicious. I received several compliments when sharing these.